By 1873 most of the buffalo herds of Kansas and Oklahoma were being hunted by Buffalo skinners, men hired by the US government. Buffalo were sought and killed for only their hides. Meat and bones left to rot. Traditional Cheyenne buffalo hunting lands were being acquired and settled by Pioneers. It was the government’s way of putting an end to the Indians’ reliance on a major food source and way of life. Most Southern Cheyennes were on the Cheyenne/Arapaho Reservation in that time period. Bands had to get permits to hunt off agency or reservation boundaries. 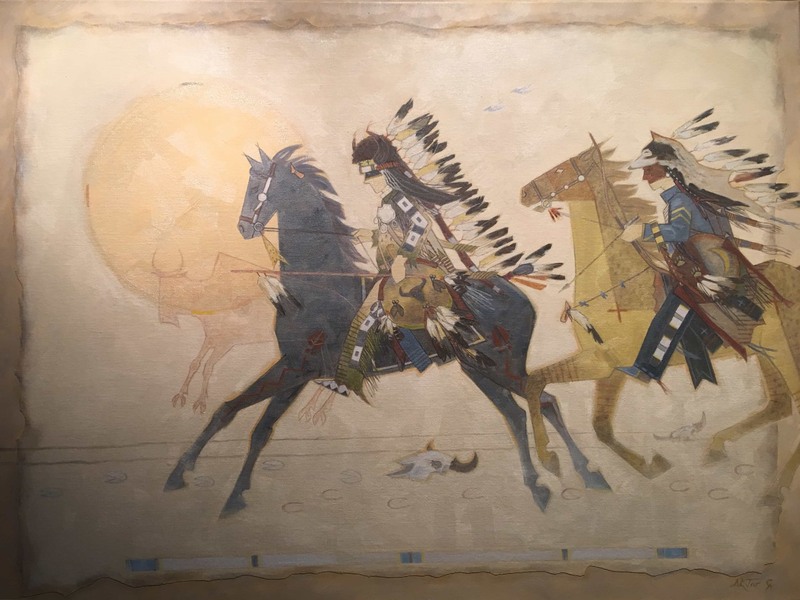 The hunts were monitored by an agency official.The painting projects one of the last great buffalo hunts during that era. Bulls were a favorite to harvest. It instilled strong Medicine on the warrior who shot it. Still many others were taken for a food source to feed and nourish the people. Other parts of the animal were not wasted. Hides were tanned and used. Sinew for sewing, hides for shields and so on. In the middle of the painting is the primitive drawing of a buffalo, representing its spirit. There are other important symbolic meanings in the painting.